CNG: The Coin Shop. KINGS of MACEDON. Alexander III ‘the Great’. 336-323 BC. Fourrée Tetradrachm (31mm, 15.35 g, 9h). Struck late 4th-early 3rd centuries BC. KINGS of MACEDON. Alexander III ‘the Great’. 336-323 BC. Fourrée Tetradrachm (31mm, 15.35 g, 9h). Struck late 4th-early 3rd centuries BC. Head of Herakles right, wearing lion skin / ΑΛΕΞANΔPOY, Zeus Aëtophoros seated left, no other symbols or controls. Cf. Price 844 for an official issue with no symbols. EF, slight double strike, minor splits in silver platting around edge. An impressive contemporary imitation, well centered on a broad flan. This handsome tetradrachm is evidently a contemporary counterfeit, the product of an unofficial mint. 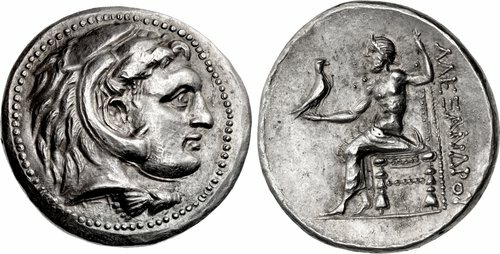 Although it appears to be a normal silver tetradrachm of Alexander type, it has a copper core, detectible via minor cracking of the thick silver plating around the edge, as well as the lighter-than-normal weight of 15.35 grams (about two grams light for a tetradrachm of this era). The coin’s high quality indicates this mint possessed die engravers and mintmasters as talented as those employed by the Hellenistic states.